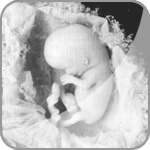 The first eight weeks of human development are called the embryological period. After eight weeks the embryo becomes a fetus, and after birth a neo-nate. There are various ways to determine the age and development of an embryo. It should be noted that age and stage are not the same thing. 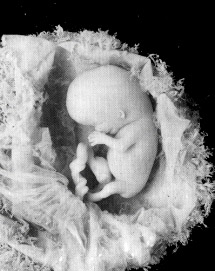 An age is a measurement of time where as stage of development is an assessment of the level physical development of the embryo. Like older babies and children, embryos will develop at varying rates which may depend on a variety of factors in the embryos environment. The 23 Carnegie Stages of Development used to describe embryonic development were identified by Dr. George Streeter. About his definition of those stages Streeter says in his publication Developmental Horizons IX through XXIII. "In a continuous sequence of structural alterations such as occurs in the development of an embryo, any subdivision into stages must necessarily be arbitrary, and the number of possible stages becomes infinite. ... one must not fail to take into consideration the individual parts of the organism, since these do not develop at an equal rate. For that reason no attempt will be made, to determine the greatest definable number of stages of the embryo. Instead the author concludes that it will be more useful to segregate embryos into groups or periods that represent levels in their structural organization as a whole"
As you move through this section of the site you will find we have provided a brief description of what is occurring in the embryo at each stage of development, reconstructions of embryos, photos of the embryos and images of the histologic sections. There are some animations and VRML models as well. For a summary of the stages, see the Stages Table (PDF 82 KB).